Synaptics has three new technologies to talk about, ClearPad, ForcePad, and ThinTouch. All bring a bunch of new tech to bear, resulting in thinner, better, and possibly cheaper touch interactivity, all with more features than the ‘old way’. First up is ClearPad, this is basically Synaptics’ name for a touchscreen with the sensor integrated in to the display itself, not glued on as a separate layer between the display and the glass cover. To make matters better, they also combine the transmit and receive layers to save yet more height over and above the screen integration. If you know don’t how capacitive touch sensors work, it is pretty simple, they have a large transmitter that generates an electro-magnetic field and a point receiver that reads the field. When you bring an object in to the field, it modifies it to varying degrees. Depending on how close the object is, and what it is made of, the field changes strength and shape. The receiver detects this, and with a little math that we won’t get in to here, it can figure out what is above the sensor and how far away it is. That is basically how modern capacitive touch screens work. Synaptics brings a transmitter and receiver pair to a single layer, and also does it in a way that is compatible with modern LCD screen making processes. This is industry slang for “You can make both together without one screwing up the other”. That is how they get rid of a separate touch layer, the magic is making it compatible with the screen manufacturing process, a single transmit/receive layer is just a bonus. 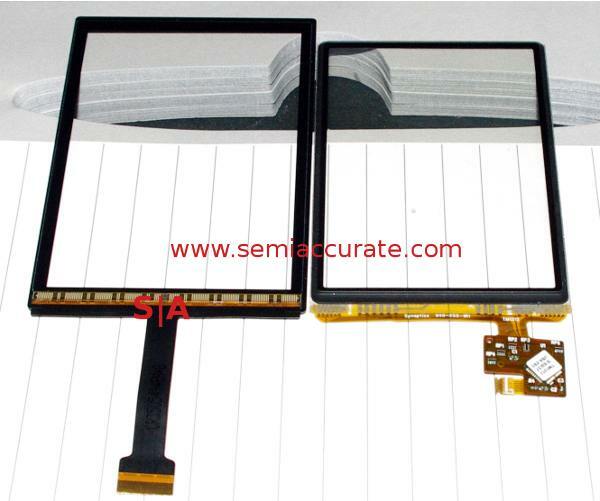 This however brings up a rather thorny problem, is Synaptics making screens now? Short story, no, they just provide screen makers with the technology, presumably for a fee, and help customers integrate a touch layer in to their designs. Synaptics has a bunch of tools and simulation software that they say will allow a screen maker to simulate the end result and get performance numbers before the design is finalized. This saves a lot of cash, not to mention time saved by not having to re-spin the glass. That isn’t to say that they are letting others do all the work, they still make the controller that the new touch screens plug in to. This means the screen is thinner, cheaper, and quicker to design for the screen builder, plus Synaptics only has to make a single standard type of controller. This controller can also integrate a display controller as well, that means the bits that light up the pixels, not the GPU, so the OEM doesn’t have to do that either. As you can see, the module on the left has the touch layer integrated in the display, the one on the right has the touch functions on a separate layer. The right panel has a pretty hefty bump up at the edge, and the thickness difference is very easy to see in person. One thing the pictures don’t show off well is how much the added layers absorb light, distort colors, and are, technically speaking, icky. The integrated display was notably clearer, not perfect, but not nearly as yellow tinted and dark as the panel on the left. Synaptics calls the integrated panel and integrated controller pair InCell, and it allows manufacturers to do some very useful things in addition to a thinner, lighter phone. That is not to discount the thinner aspect, if it only saves 1mm of Z-height, that is more than 10% of the iPhone 4S’ thickness. By absorbing less light, manufacturers can reduce the backlight brightness so you get more light out for less power used. Better battery life and it runs cooler, how can you complain? If you can think of a reason to complain; then also keep in mind that fewer layers mean less distortion so fewer optical tricks are needed to compensate and it ends up with vastly increased viewing angles too. If you are wondering how the new Sony gets the Xperia P screen to look so good…..
ClearPad is basically this technology, discrete sensor/InCell and a panel with integrated display and touch sensors in one layer. There are four versions, Series 2, 3, 4, and 7. 2 is for low end ‘feature phones’ and is a cost savings play, 3 and 4 are for higher end smartphones, while 7 is for laptops. 3 does the touch processing on the host CPU, 4 adds that functionality to the screen controller itself. Since you don’t have to send those signals across a bus to the host CPU, it can cut the sense to display latency down from about 70ms to <30ms. Other things can and do affect latency, but it isn’t hard that hard to see how a closed hardware loop is faster than a generalized bus transaction to a busy CPU. If you doubt that it is faster, the demo board above was a Qualcomm S4 development board with two controllers hacked in to it. In the demo, you move your finger around, and the dot shows where the controller thinks your finger is at the present time. With the integrated solution, the dot trailed the finger by visibly less distance. With the coming of badly designed touch UIs forced in to laptops by two companies that think they know hardware and software, we are on the verge of expensive and annoying PCs. Synaptics is doing what it can to lessen the pain, and one major way is to integrate the controller for the screen and the laptop touchpad in to one single IC. In addition to one less controller, the gestures will all be common between the two interfaces, something that may sound minor but can be very annoying if it isn’t done right. For the OEM, they get simplified software, hardware, and less integration to manage. That is the idea behind the ClearPad Series 7. If you are bored with simple touchpads, you will be happy to hear about the second new toy from Synaptics, ForcePad. If you can’t figure it out from the name it is a touchpad that also senses the level of force you place on it. The current version of this pad can read at least five points it is not a hardware limit, the hardware can do 10+ and tell how much pressure each one is exerting. The ForcePad has six bits of resolution, 64 levels for the math averse, and each one can independently sense up to 1000g. The demo above is a production Lenovo Ultrathin with a ForcePad hacked in to it. With current software, it will sense five points, more is impractical for the user even with the massive pad sizes of late. To make things better, the ForcePad has no moving parts, it is all solid state. On top of that, you might have noticed the lack of buttons, they are indeed a thing of the past. If you can click anywhere, what do you need physical buttons for again? Before you complain, we tried it, and after about 2 minutes of playing around we can confidently say that any potential learning curve will be very short. 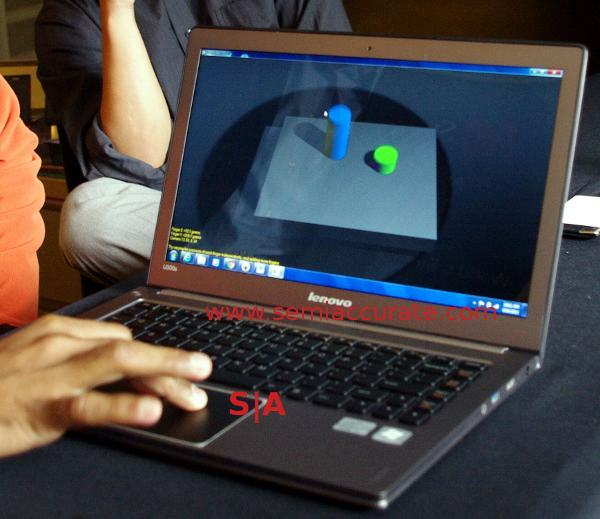 Windows 8 has 8 gestures, Synaptics adds three more, and with a ForcePad, there are an additional five. On top of this, ForcePads automatically recalibrate on the fly, basically with each scan at 100+ Hz they re-learn their physical surroundings. Have a laptop that flexes and makes the touchpad do weird things like phantom clicks? No problem with a ForcePad, it just maps them out. Some of the gestures took a bit of adjustment, but within about 15 minutes, you will probably have learned the majority of them. Unlike its predecessor, the ClickPad of iDevice acclaim, the ForcePad has no hinges, buttons, or moving parts. This brings a serious longevity increase, and the new way is also much thinner than the old, a claimed 2mm less. Over a 105 * 65mm area, the spec for Win8 pads, that gives notably more internal room in the moronic Ultrabook form factor for things like a bigger battery. While less space used is a good thing, it shows in pretty stark relief how right SemiAccurate was about the abject stupidity of the Ultrabook design rules, they are indeed shiny things for the stupid. A much bigger advance is the new keyboard technology from Synaptics called ThinTouch. In case you can’t get the picture from the name, it is indeed thinner than the competition. Synaptics claims sub-2.5mm height for their keys vs more than 3.5 for the best of the rest, going to 6mm for some with decent key travel. If you take the whole module into account, the Ultrabook spec puts a limit of 13.5mm for the whole thing, the ThinTouch will save almost 10% of that, slightly more on average. To answer that question, there was a blind test with four buttons labled A-D, each with a key taken from a modern laptop keyboard. Yes, they were all the same letter, in this case the “3” key. We know that is not a letter, but it is the same, and number does not work as well in the original context. Ah the joys of writing. The test itself was simple, press the keys, and see if you have a preference for feel. SemiAccurate liked A or D, as did the two other people taking the gruelling test with us, although some preferred one or the other, but all preferred one of the two over B or C. After we all picked, we were told that A was Apple, cruelly sliced from a modern laptop, C was a normal PC, and B and D were ThinTouch keyboards. B was an older prototype, D was the latest and likely final revision, and it felt at least as good as a modern Apple keyboard, generally credited as the best of breed. How does it work? Look at the mechanisms above, the Synaptics keyboard moves in two planes to increase distance travelled, the traditional scissors only use one. This clever adjustment, remember back to geometry that A^2 + B^2 = C^2, allows them to get more travel out of a less height, reducing the aforementioned Z-height of the mechanism. That said, if the thing feels like garbage, who cares? Being a keyboard snob, we can confidently say that Synaptics has nailed it, and our two co-testers agree. Although they wouldn’t say exactly how it works under the lid, it does definitely work, and feels good too. And if you think the 2mm saved by the touchpad was a lot of volume saved, think about how much 1-3.5mm times the area of a keyboard saves. Think more battery life, lots more, but not enough to make the Ultrabook spec not stupid. Better yet, the ThinTouch mechanism also incorporates some of the ForcePad tech, and yes, it senses pressure like the pad. That means a keyboard is not simply binary any more, it can now give some pressure feedback. While there is no talk of doing anything interesting with it yet, I can already see some clever hacks coming from this, music being only one of them. Security based on key attack and release speed anyone? Useful repeat speeds based on hit rate? The list goes on. If you can’t see where this is going, remember back to the ClearPad Series 4 and 7 with the integrated touch controllers? The idea was to have a single chip for both the touchpad and the screen touch functions. Did I mention Synaptics now makes keyboards? Did you know they make keyboards that have force sensing? Now do you see where this is going? One controller to rule them all, one controller to (key)bind them! Less space used, less connectors, less integration hassle, lower assembly costs, and maybe overall lower cost to the OEM.